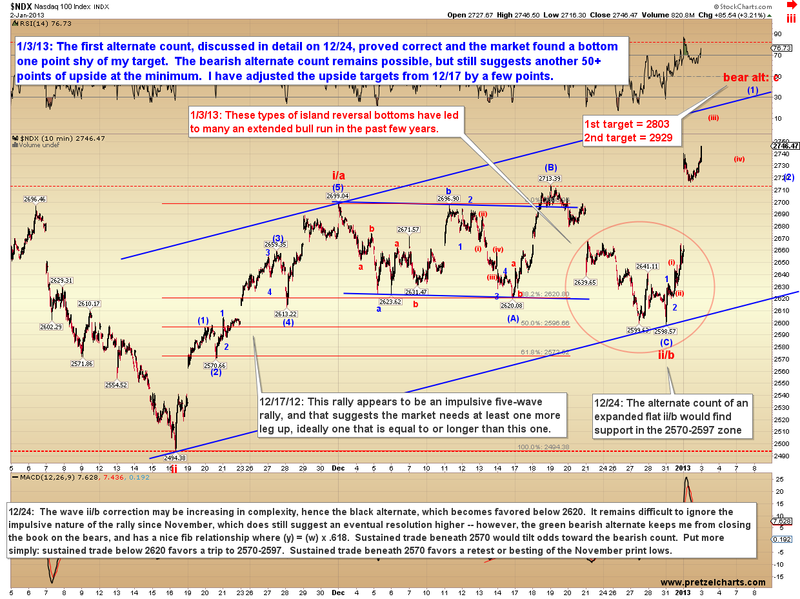 Last update noted that probabilities favor that this rally leg since November is only half-way complete. I continue to favor that view. Yesterday performed as expected for a nested third wave rally, and the bear count (which I’ve discounted since October) is very close to being invalidated once and for all. Trade above SPX 1474 would accomplish that. This market has an awful lot of bullish potential, but what can bears do to put an end to it all? 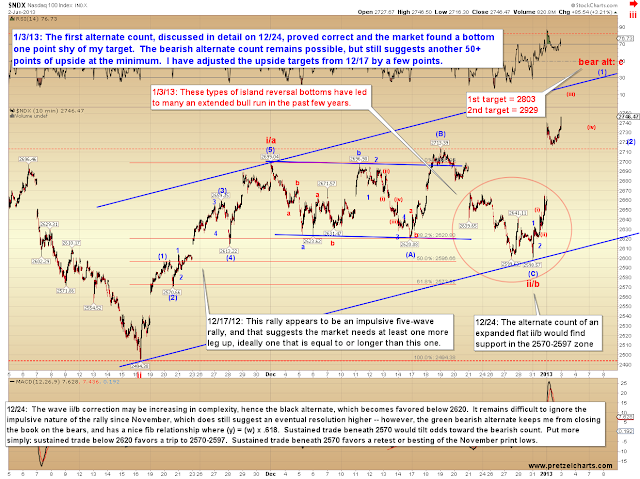 In this update, we'll cover, in brief, some key signals and price points to watch going forward. There is also one important fundamental factor, which suggests more rally fuel, which I’ll cover later. The first chart I'd like to share is the Philadelphia Bank Index (BKX) which, as long-time readers know, I believe has acted as a critical "tell" over the past months. BKX has finally vindicated my view that the November low was, in fact, an intermediate bottom, and that the decline into that low was corrective. 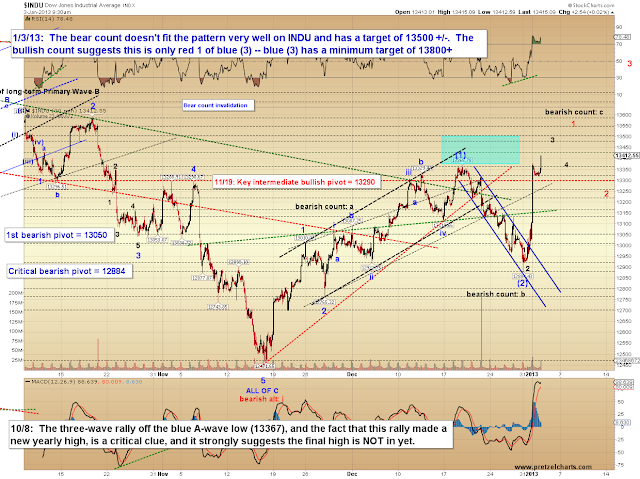 The chart below is the daily BKX and covers the two most likely wave counts. As noted on the chart, the first bearish option isn't particularly bearish, at least over the intermediate term. The first bearish option would see this as a three-wave rally, which could complete after another small leg up or two, then a large correction (50-62%), followed by another new high. The bullish count is exceedingly bullish, and, without any present evidence to the contrary, I am left to continue favoring that count. Currently, the bullish potential is such that one probably simply wants to chase the market higher with stops, since if this is the "nested" third wave depicted, it will only correct from time-to-time on its way higher (much like yesterday's action). The S&P 500 (SPX) outlines the preferred bullish option, and notes some key levels. The bears' final hope here is that the wave I'm viewing as wave 3 is actually wave C of an ABC correction (shown in more detail on the INDU chart which follows). 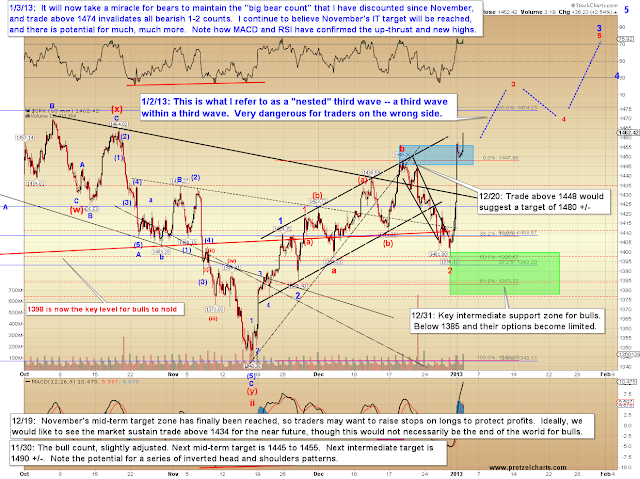 Trade above 1464 would put the bear count under severe duress, and trade above 1474 would finally lay it to rest. 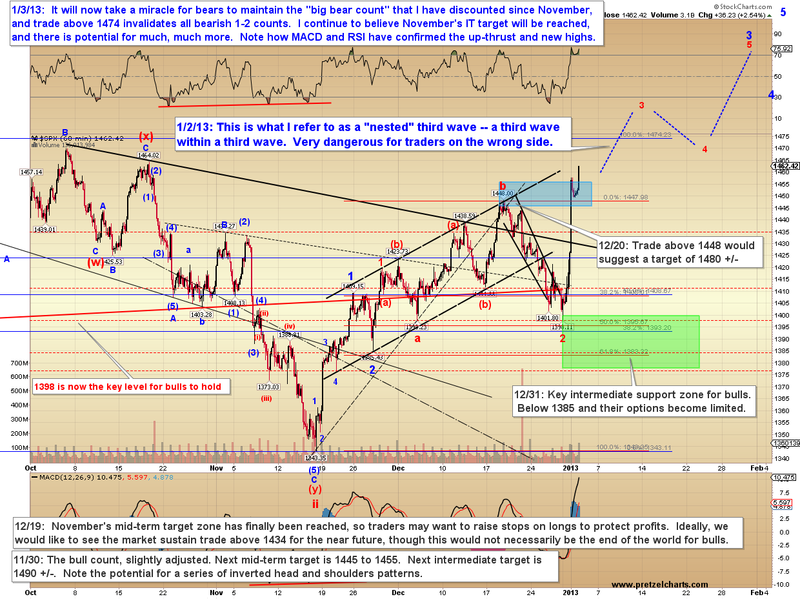 In my opinion, the Dow Jones Industrials (INDU) continues to make the bear count low probability. The pattern here is a bit harder to reconcile as an expanded flat and -- while there are always corrections along the way -- that suggests the rally will continue to have legs for the foreseeable future. 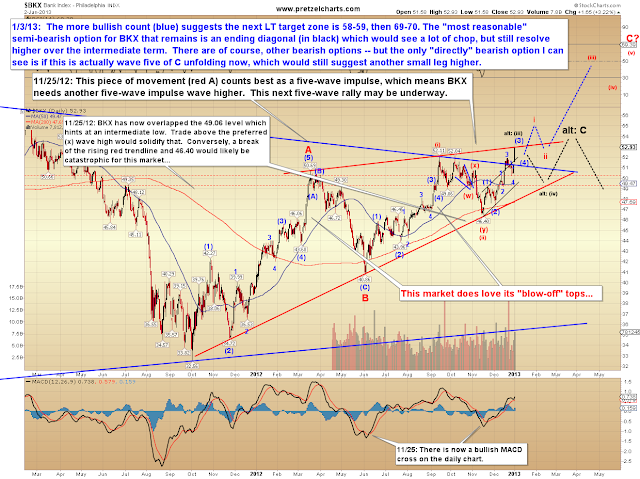 I have outlined the first two key levels bears need to reclaim in order to begin creating doubt. Finally, a quick update to the Nasdaq 100 (NDX) which ended up following the roadmap I outlined as my first alternate count, published on 12/24 (well, to be fair, it missed my target for the bottom by one point). Note the recent island reversal (an isolated bottom separated by a gap down and a gap up) -- in the past, these have frequently been bad news for bears, and signaled that a move had real legs. The fundamental factor I wanted to mention is important. The Federal Reserve has, of course, continued to feed QE-Infinity liquidity to the Primary Dealers throughout recent weeks -- however, data indicates that once the fiscal cliff situation started to get hairy, the Primary Dealers largely withheld those funds from the equities markets. This means that there's an above-average pile of money suddenly being thrust into the market, now that resolution has been reached. In addition to that, there are surely many bears who were caught short, and likely many who are trapped that way (hopefully, none of my readers were taken by surprise by the strength of this move). Those shorts should provide additional rally fuel in the form of short-covering, since undoubtedly many of the more stubborn bears saw no reason to cover after that massive gap up. The psychology of many traders at that point is usually, "Well, I might as well wait now and see if it can crack the prior swing high." In conclusion, the price pattern is indicating that higher prices remain very likely. 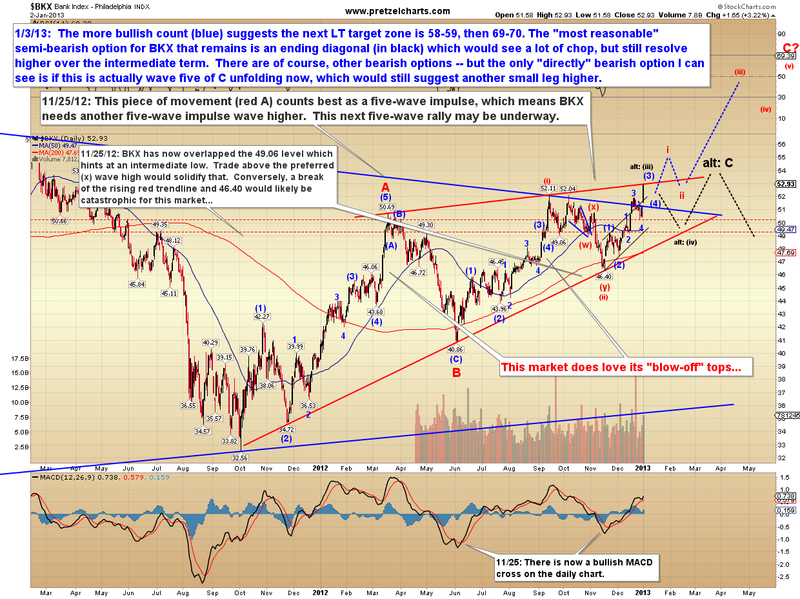 There is also solid potential for a long-lasting rally, and that must be respected. The bear count is running on fumes at the moment, and very close to becoming invalidated -- I've never liked that count, but maybe bears will surprise me in the last hour. Much as I remain in awe of the ability of the central banks to print this market into oblivion; given the price charts, my conclusion can only be to remain intermediate bullish. In the next few updates, we'll cover even more detail on the long-term potentials. Trade safe.